A new year is like a blank book, and the pen is in your hands. It is your chance to write a successful story for yourself. 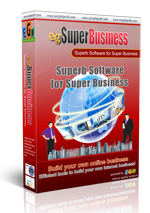 We are pleased to announce the release of the newest update for product egSuperBusiness + Shop. and some other of improvements. Because many requests for payments through Skrill or Bitcoin, now EGN will accept payment through Bitcoin and Skrill. Hopefully it could be easier for our customers to make payments. For more information, feel free to contact us through Support Ticket. Thank you and success always! We received many requests to resale our products using White Label / Rebranding method, Therefore we decided to create EGN's White Label program. For more information about this program, please read on page White Label Program or if you have another question, feel free to contact us through Support Ticket. My experience with script4profit was perfect, i receive a good support and a very good script quality. They are so professional and serious company ! I choose them for their fast support, it's necessary when you want to launch a big business as mine with a real company. We advice everyone who want a good script and run his own buisness to deal with script4profit, they are simply the best.